Wellsprings Pediatrics provides routine and preventive healthcare for children from infants to age 18. Our compassionate and caring medical team of pediatricians follow your child’s care every step of the way. 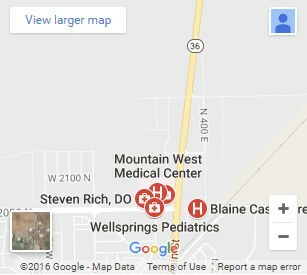 Steven Rich, DO is dedicated to providing personalized medical care to the Tooele County area. We offer support and guidance to parents regarding all aspects of your child’s health, including screenings, annual well child check-ups, sports physicals, vaccinations, and sick care. We also offer specialized care for asthma, ADHD, adolescent depression and anxiety. Same-day appointments and on-call pediatric services are available at all times. We are accepting new patients. To request an appointment, please call (435) 882-9035.